This newly renovated oceanfront, second floor condo is located on Seven Mile Beach about a mile from Georgetown and walking distance from many of the stores, restaurants, and night spots. It has a large,16x25ft. open air patio overlooking the Ocean with a view of Seven Mile Beach from end to end. The patio provides front row seats to the magnificent Grand Cayman sunsets. At night you can fall asleep to the calming sounds of the Ocean right outside your condo. The complex provides the perfect balance between the privacy of your own condo and the amenities of a four star resort. The condo complex has its own private beach, two fresh water swimming pools, a freshwater hottub, a children's wading pool, and a swim up bar and grill. There is a marine park off the beach which is ideal for snorkeling. We bought the condo in 2003 and rent it out. We dive and like the island. diving, over looks ocean, beach has cove which is great for snorkeling, family friendly resort with kiddie pool and swim-up grill/pool bar. 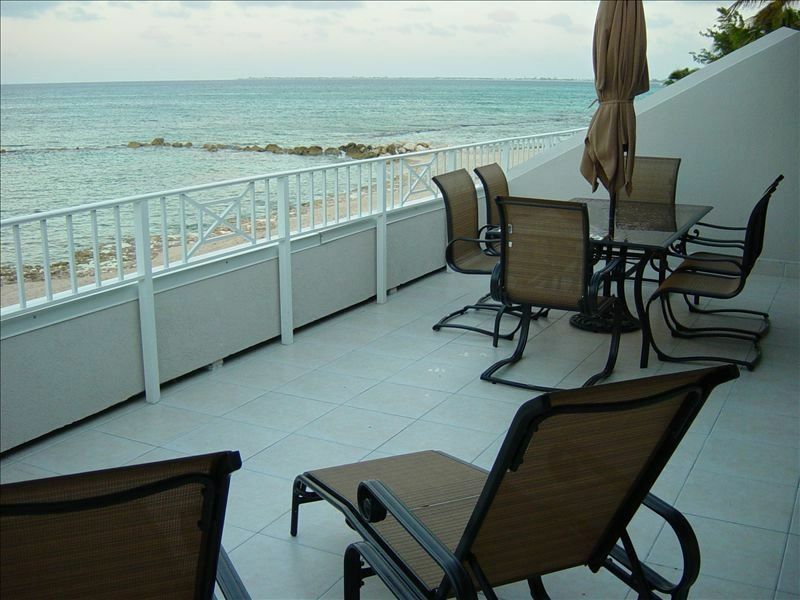 Our condo is a second floor unit beachfront unit approximately 300 feet from the water. Our condo is a second floor unit right on the Ocean, approximately 300 feet from the water. We have an open air deck that has incredible ocean views and sunsets. Our family of 5 had an amazing time. The condo was very spacious and clean. It overlooked the ocean with its own beach. I would highly recommend this place. My family (myself, husband, adult son and daughter) stayed there over my daughter's Spring break. Jean, as others have said, is very responsive to any questions. The condo had enough room for all of us and it was great that everyone had their own bedrooms. The location is perfect. Although we didn't cook, the condo is well equipped and we certainly could have with no problem. We had coffee on the very large balcony/patio overlooking the ocean every morning and beautiful sunsets every night. We could walk to many restaurants and small shops. The cove is great for relaxing swims. We didn't snorkel past the cove- ran out of time, but did paddle board- very fun. We rented a car but we didn't need it, although we did go exploring and found some beautiful scenery and quaint restaurants. All the attractions that we went to have transportation to their site. The turtle sanctuary was a great experience. There were cruise ships in that day so when we got there, the attraction was really crowded, but after about 30 minutes, it cleared and we had a leisurely half day interacting with the turtles. Stingray city was fun but very crowded and the snorkeling portion was disappointing (went through Red Sail tours). The condo has access a great pool area with swim up bar and small restaurant and also access to the Margaritaville amenities. The only problem is the vacation was too short! We would definitely rent this condo again and recommend it highly. Thank you Jean. We loved sunset cove. Everything was great. The condo was so nice.. Jean king amswered all my questions right away. Looking forward to coming back. Would definitely recommend. The condo is in a perfect location with a great beach and access to all the Margaritaville amenities, giving you the best of both worlds, resort living with condo living. Outdoor space was perfect for morning coffee and evening cocktails watching the breathtaking sunsets. The owner was very accommodating. Thanks for a great vaca! This is the second time we stayed at Sunset Cove but the first time at this condo. It was perfect! It's right on the beach, you can set out on the patio and watch the sunset, which is AMAZING. The condo was perfect for our group of 5, it has everything you need for your stay except the food and drinks. I highly recommend this place. I hope we will be coming back soon!! We loved our stay here! The location is excellent and the condo is very comfortable. This was a perfect vacation spot! We had a family of 4, so the condo was probably bigger than we needed, but it was nice for each of our daughters to have her own bedroom. Our daughters are in high school and college, but the set up of this resort is great for all ages. The condo was well stocked with beach towels and pretty much anything we needed during our stay, aside from grocery and personal items. Kirks grocery store was just a few blocks away and has an amazing selection of everything. We brought our own sunscreen and spices, but you can buy them on the island as well. Lounge chairs were always available on the beach or at the pool. The island is spectacular and there is plenty of great snorkeling, eating, and shopping easily accessible. We rented a car, but it is hardly necessary. It was convenient to have a car for grocery store runs, but we could have walked too. Our favorite excursion was a full day with Captain Vernon, who took us on a private boat tour to Stingray bay, Rum point for snorkeling, Starfish point, and Kaibo for lunch on the beach. 345-321-4036. We called a few months ahead to schedule with him. We can't wait to come back again! Refund Policy: non-holiday weeks: prior to 90 days - 100% of deposit less paypal fees. 89-45 days prior to arrival 80% refund less paypal fees. No refund less than 45 days prior to arrival. Holiday weeks: 120 days - 100% of deposit less paypal fees. 119 days - 60 days prior to arrival 85% refund less paypal fees. No refund less than 60 days prior to arrival.